Tamale (N/R), Jan. 23 – Mr Theophilus Osei Owusu, Acting Director, Directorate of Agricultural Extension Services (DAES), has said an effective extension system is vital for an effective and efficient use of agricultural technologies to accelerate agricultural development. He said to ensure a successful agricultural transformation in the country, extension systems would play a significant role in the disseminations and adoption of agriculture technologies by smallholder farmers to increase production. 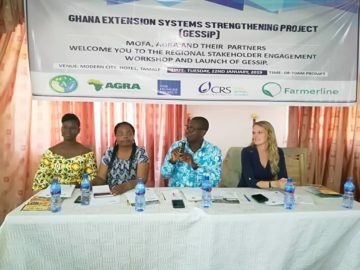 Mr Owusu was speaking at a stakeholders’ workshop in Tamale to launch the Ghana Extension Systems Strengthening Project (GESSiP) – aimed at increasing productivity and incomes of smallholder farmers. He said “we cannot do without effective and efficient extension services if we want to accelerate our agricultural development”. Mr Robert P. Ankobiah, Chief Director, Ministry of Food and Agriculture (MoFA), said government’s flagship programme of Planting for Food and Jobs (PFJ) is established on the principle of providing dedicated agriculture extension services to farmers for increased production. He said agriculture extension services in the country has gone through transformational changes over the years from Training and Visit System (TVS) to the concept of Transfer of Knowledge by Agriculture Extension Agents (AEAs) to reaching farmers with information. He said the sector is faced with challenges, which MoFA intends to adapt to strategies that would ensure the effectiveness of agricultural extension system in the country to offer support to farmers to increase production. Mrs Carolyn Edlebeck, Head of Programmes, the Catholic Relief Services (CRS), said the project is aligned with CRS new agency strategy of ensuring that farmers achieve a dignified and resilient livelihood in a sustainable landscape of creating ‘pathways out of poverty’. She said the GESSiP project would alter traditional behavioral practices of farmers as well as establish a new standard for extension delivery systems to support farmers to realize their full potential to increase yield. Dr. Rafaro Madakadze, Senior Progamme Officer, Extension and Capacity Building at Alliance for a Green Revolution in Africa (AGRA), said the project would offer farmers a unique opportunity to learn on improved agricultural technologies through demonstration by self-employed Village Based Advisors (VBA). She said the project would complement Government’s flagship programme of PFJ by providing effective extension services to smallholder farmers to strengthen their capacity in good agronomy practices, improved technologies of seeds, fertilizers, and financial literacy services. Dr. Madakadze said a consortium of implementing partners of the project would partner key private sector players within the agriculture Diaspora for a collective and effective implementation of the projects to address challenges of smallholder farmers for increased yield. The GESSiP is a three-year project implemented by CRS, MoFA, DAES, The Hunger Project (THP) and Farmerline aimed at increasing productivity and incomes of smallholder farmers within 28 targeted districts. The projects target 672,000 smallholder farmers as well as 2,240 trained and certified VBA to be implemented by THP in the Brong Ahafo and CRS in the Northern Region with improved technologies of seeds, fertilizers, good agronomy practices and financial literacy services. The project funded by AGRA aims to catalyse and sustain inclusive agricultural transformation to increase incomes and improve food security by promoting and strengthening extension services delivery in the country.